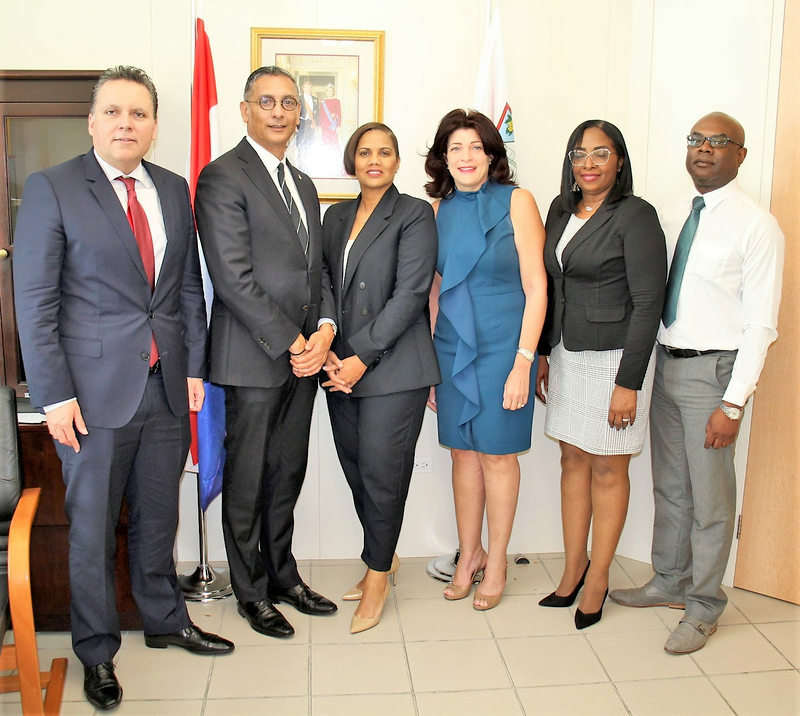 From left: CBCS Director Jose Jardim, Finance Minister Perry Geerlings, St. Maarten Branch Manager Raquel Lo Fo Wong, CBCS Director Laila Matroos, Executive Secretary Nihailo Eustachia, and Director in Geerlings’ Cabinet Wilgo Lieveld. PHILIPSBURG–Members of the Central Bank of Curaçao and St. Maarten (CBCS) Board of Directors met with Finance Minister Perry Geerlings on Wednesday to update him on the bank’s operations and projects. The meeting was one of several sessions that take place periodically to update governments in St. Maarten and Curaçao on the status of affairs within the monetary union. The group had a follow-up discussion on, amongst other things, the plans to move from the Netherlands Antilles guilder as the official currency to a new “Caribbean guilder.” The move to the new currency was established by law since 2010 when the Netherlands Antilles was dismantled on October 10, 2010, and St. Maarten and Curaçao obtained the status of countries within the Dutch Kingdom. Geerlings said the move to establish a Caribbean guilder needs proper preparation, as it will involve dialogue with both governments, beginning with the two finance ministers creating the framework for a structured transition with CBCS guiding the process. The board of directors introduced recently-appointed CBCS St. Maarten Branch Manager Raquel Lo Fo Wong to Geerlings. Lo Fo Wong was named as Branch Manager on March 1. She is responsible for the branch’s daily operations and reports directly to the board of directors. Dit bericht werd geplaatst in _Curacao, _Sint Maarten, Financiele sector, SXM-Daily Herald. Bookmark de permalink .